Children’s Values: What’s the most important value to teach children? Children learn their basic values at home by observing their parents’ behavior and by talking with them. However, children may or may not learn the values that are the most important to you. What values or qualities do you think are important to instill in children? Which value is the most important one? In a new survey, the Pew Research Center asked Americans about the values they believe are especially important to teach children. Before I reveal any findings, consider the following list of 12 values. Which one is the most important value to teach children? Here are Pew results: More than nine of ten American adults (93%) say that “being responsible” is especially important to teach children, with more than half (55%) selecting this value as the single most important one. Belief in the importance of teaching responsibility is widespread. Across the political spectrum, from consistently conservative Americans to consistently liberal Americans, responsibility is seen as the most important value to impart to children. For example, 96% of Americans who are consistently conservative say “being responsible” is important, with well over half (61%) naming it as the most important value to each children. At the other end of the political spectrum, 92% of consistently liberal Americans say “being responsible” is especially important to teach children, with 47% naming it as the most important. There is even more common ground when it comes to the values that Americans believe are important to teach children, as we’ll discuss tomorrow. Of course, there are also sharp differences along ideological lines, which we’ll cover later in the week. Do you agree that “being responsible” is most important on this list? If not, which value tops your list—and why? What are the top three on your list of qualities children should acquire? Doing Good: Why do the poor give more than the rich? Yesterday, we learned that Americans generally donate around 2% of their discretionary income to charity. The number is a far cry from the 10% often encouraged by charities and religious organizations. We could point to plenty of reasons for the discrepancy—tight finances and a tough economy would likely top the list. But that doesn’t seem to stop low-income households in the U.S. from giving. Did you know that low-income households tend to donate a much larger share of their discretionary income than the wealthy? Some experts have speculated that the wealthy are simply less generous, and as wealth increases, compassion, altruism and ethical behavior decrease. What’s more—a study at The Chronicle of Philanthropy found that wealthy individuals who live in affluent areas are less likely to give than those who live in more socioeconomically diverse areas. Simply put: When the rich don’t see the poor, their inclination to give decreases. The percentage of income donated isn’t the only major difference in how the rich and poor are giving. The wealthy tend to direct their donations not to the needs of the poor, but to other causes including cultural institutions or universities (often alma maters.) The poor, on the other hand, tend to give to religious organizations and social-service charities. What do you think? We’d love to hear your experiences! Are you surprised to hear to hear those with the least are giving the most? Does increased wealth often lead to decreased compassion? Why aren’t the rich giving to charities that primarily serve the poor? Divided America: Do you trust God or yourself? One of the main messages of OurValues.org is that, after all, Americans still have a lot in common. We are united by 10 core values. (You’ll find them all on our resource page). But when I give talks about my latest book, United America, I’m often confronted with skepticism and questions. Why isn’t the family on your list of core values? Values like these don’t make the list of core values for a simple reason: Americans are divided on many values, even though they are united on others. All this week, I will give you glimpses of the “other side” of my research on values in America: the values that divide us. Are you ready for the story of divided America? The most divided value concerns moral authority: Where is the ultimate source of moral authority? Is it God? Or, are you the ultimate arbiter of right and wrong? Many Americans say that right and wrong is based on God’s law. They also say that American kids should be raised to believe in God. Americans are unusually God believing and God fearing, according to data from the World Value Surveys. 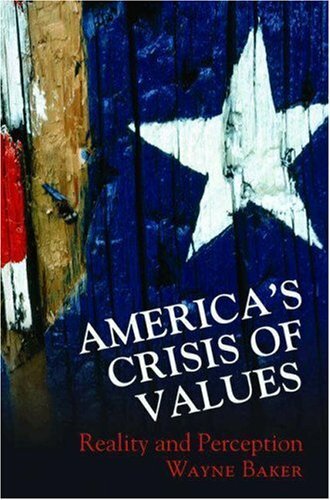 I wrote about this in my earlier book on values, America’s Crisis of Values: Reality and Perception. But many Americans don’t believe that God is the ultimate source of morals and moral authority. Rather, they say, what is right and wrong is up to each person to decide. The individual is the decider. For you, where is the source of moral authority? Does it reside in God and religion? Or, do you place your trust in yourself as the arbiter of right and wrong? Moral Crisis: Is it mostly a matter of perception? Want a free, colorful, printable chart of the 10 core values that my research has identified? Click on this image. If we share core values, why does the nation seem so divided? Why do most Americans feel that the state of morals is deplorable? I get questions like these every time I give a talk about my book United America and tell people about our 10 core values. These important questions are so persistent that I devote this week to the five reasons why we perceive a moral crisis. Reason #1 is basic human psychology. We are hardwired to give much more weight, importance, and attention to negative things than positive ones. Here’s an example I experience at the end of every teaching semester when I get anonymous feedback from my students. The course may have been quite successful, with 49 of 50 students giving me positive feedback. But what do I remember? What keeps me up at night is the one student who hated the course and told me so in no uncertain terms. I’ve learned that it’s not just me. It’s all of us. Blame evolution. Paying more attention to the negative than the positive has survival value. Early humans who stopped to smell the roses didn’t live long enough to procreate and pass on their genes. Our ancestors were the negative ones. Over time, we evolved as a species with a potent negativity bias. All of which means that we are much more likely to perceive a moral crisis, perhaps even a moral panic—even when the facts don’t warrant it. Now, don’t get me wrong. There are real problems and real issues out there. But our negativity bias makes it seem far worse than it really is. And, the reverse is true. Our negativity bias means that we give too little weight and credence to the good and the positive. So that’s one of five reasons why we perceive the state of our nation to be far worse than it really is. Is our moral crisis “real”? How much perception versus reality? Is our bias toward negativity to blame?